Meet the DHDC Directors and Managers who are dedicated to giving you New Discoveries Every Visit! Dr. Aaron Pan joined the Discovery Center as the Executive Director in 2012. Dr. Aaron Pan was born in San Francisco, CA, and grew up in Amarillo, TX. Prior to his directorship, Aaron was the Curator of Science at the Fort Worth Museum of Science. He is also currently a research associate at the Botanical Research Institute of Texas, a board member of Cal Farley’s Board of Trustees and Amarillo Convention and Visitors Council, and chairman of the Convention and Tourism Committee for the Amarillo Chamber of Commerce. Dr. Pan is also a council member for the Texas Association of Museums. Dr. Pan’s research interests include the evolutionary history, floristics, and paleoecology of African Cenozoic tropical moist and wet forest ecosystems and the flora and lepidopteran fauna of the Southern Rockies, Müllerian mimicry in velvet ants, and abalone systematics. Under Dr. Pan’s leadership the Discovery Center has launched our state of the art Distance Learning program which has reached an audience in 3 countries and 17 states and the Roaming Educator Program which takes hands on learning experiences to schools in the top 26 counties of the Texas Panhandle who might not have access otherwise. 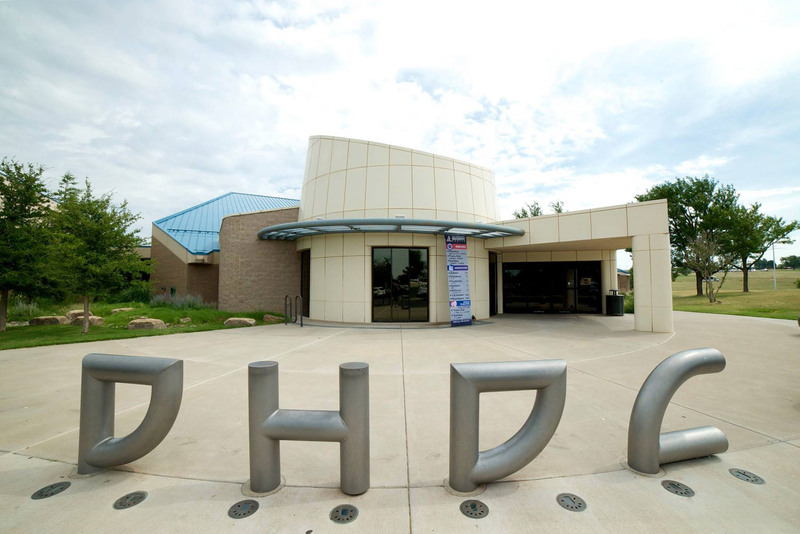 The Discovery Center has thrived with Dr. Aaron Pan as the Executive Director seeing steady growth in various programs and steady attendance. Dr. Pan may be reached by emailing apan@dhdc.org or by calling 806-355-9547 ext. 101. Kyle may be reached by emailing khadley@dhdc.org or by calling 806-355-9547 ext. 118. Regina has been in the Development field since 2008 and has experience in in marketing and communication, volunteer management, event planning, grant writing, and annual fund campaign. Before coming to the Discovery Center she was a part of the Campaign Staff for United Way of Amarillo & Canyon and was the Development & Marketing Director at San Jacinto Christian Academy. Regina is responsible for grant writing, capital campaigns, event underwriting, program fund development, and the annual fund. Regina has a bachelor’s degree from West Texas A&M University. Regina may be reached by emailing rralston@dhdc.org or by calling 806-355-9547 ext. 104. Mandi may be reached by emailing mandi@dhdc.org or by calling 806-355-9547 ext. 108. Beno attended West Texas A&M University and studied Technical Engineering. He has served in the building maintenance field since 2002 and has vast experience in building and ground maintenance. Beno’s staff and project management skills along with his general craftsmanship skills are an asset to the Discovery Center. Since he began his career at DHDC building repairs and upkeep are done efficiently and with the highest quality work. Bridget may be reached by emailing bgervasi@dhdc.org or by calling 806-355-9547 ext. 103. Hillary may be reached by emailing hillary@dhdc.org or at 806-355-9547 ext. 107. Shanna responsible in part for communicating all of the wonderful things that the DHDC has to offer to their members and the public. She is also in charge of planning special development events. Shanna has a bachelor’s degree in Marketing from The University of Mississipi (Hotty Toddy!) and has worked in development and marketing for over 10 years. Shanna and her husband, Austin, have two children – Sadie and Hayes, who love that their mom works at the Discovery Center. Shanna may be reached by emailing scollins@dhdc.org or at 806-355-9547 ext. 120.